KMPlayer is one of the most popular video players in the world, and it has been enjoyed high reputation for its functionality. What is regrettable is that it has no Mac version. As the number of Mac users is rising rapidly, the problem of media player becomes more conspicuous. Thus a free KMPlayer alternative for Mac (High Sierra/Mojave/El Capitan/Yosemite/Mavericks) is called for by Mac users. 5KPlayer is an amazing free KMPlayer alternative for Mac (OS Mojave and before) as well as Windows PC (OS 10 and before). Besides the excellent performance of KMPlayer, 5KPlayer will surprise you with features beyond your expectation. 5KPlayer is the latest software of DearMob, Inc.. With Mac and Windows versions, 5KPlayer is dedicated to offering most people the best visual and audio experience. The most important and basic functions of KMPlayer can also be achieved on 5KPlayer-the best free KMPlayer alternative for Mac (El Capitan/Yosemite/Mavericks). 5KPlayer can directly play any media file on Mac/Windows PC without any conversion and help from the third-party software because of its internal codec. With support for 4K and 5K video play, videos in superb quality can be enjoyed at your home. 5KPlayer also provides full control over DVD selection, movie menus, audio menus, subtitle menus. It is capable of saving out the sound tracks of videos and snapshot frame as image. To ensure the best perspective to view videos, the screen of 5KPlayer is rotatable. 5KPlayer is designed with multiple languages, and tech support is always ready to help you if you have any questions regarding downloading, launching and operating. With highly customized library, users can manage their videos tailored to themselves. What should be highlighted is that 5KPlayer supports AirPlay. 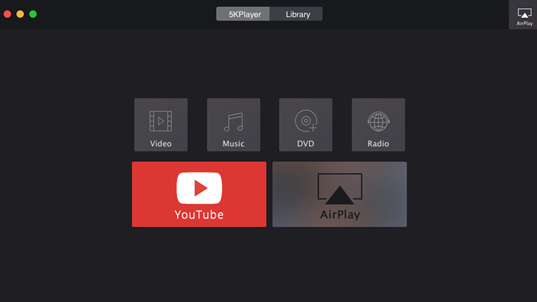 Therefore, 5KPlayer can turn Mac/PC into a free AirPlay server to send and receive media from other AirPlay supported devices. 5KPlayer is more than a KMPlayer for Mac alternative. How to Use the KMPlayer for Mac Alternative to Play All Files? With extremely easy-to-use interface, users can quickly and effortlessly handle it. Please check the detailed tutorial below. Step 1. Download the KMPlayer Mac version -5KPlayer and run it. Step 2. Locate the file you want to play, and you can play it via dragging and dropping; right click the very file and choose the player from open with; or just click the video icon on the user interface and choose the very file from the data base. The detailed settings of 5KPlayer can be achieved via right click on the ongoing video, and the shortcuts of many functions are listed on the top of the screen. Files can be added to any categories or be removed from the playlists you want and Favorites can be sorted out or established/added to the new playlist(s). Note: Other than being the best free KMPlayer for Mac alternative, 5KPlayer is an all-in-one multimedia toolbox. It can not only play all videos but also download videos from most video sharing sites like YouTube, Vimeo, Dailymotion, Vevo, and other 300+ sites. 5KPlayer can meet all your requirements on media player, like downloading media files, playing media files, and streaming media files, which means once 5KPlayer is installed, you should never need to touch another player. The newest guide to teach you how to download or update to KMPlayer 4.1.3.3 without installing any KMPlayer bundleware.